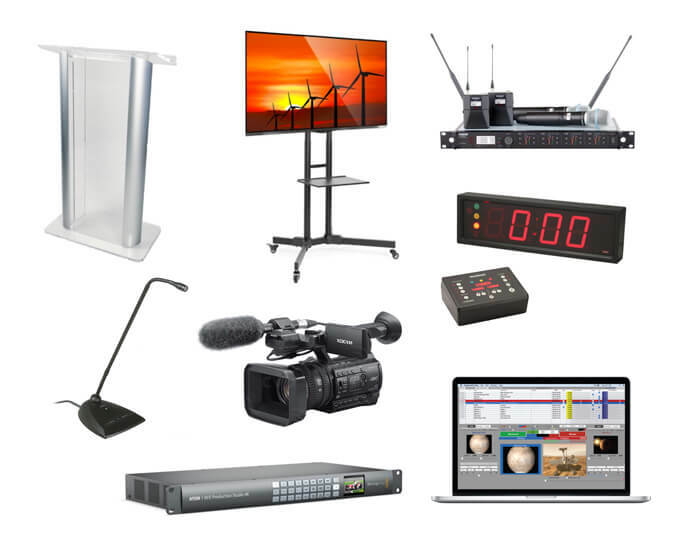 AV Equipment Rental - Gear up for your presentation, panel discussion, or corporate function with our smart selection of cutting-edge AV equipment. Soundhouse provides audio visual solutions, servicing hundreds of presentations and corporate events every year. We offer video, lighting, staging and presentation equipment: projectors, screens, stage lighting, room lighting, large LCD displays, podiums, staging, pipe and drape, wireless audio and video, playback equipment and more. We have become NYC's fastest growing AV company by combining the right selection of equipment with the best customer service in the business. We're happy to recommend equipment with your budget in mind. Our pricing is guaranteed to beat other audio visual companies in NYC. We can also provide event AV support with 24/7 delivery, setup, and on-site technical services. Use our AV Quote Request form or call us at 888-826-1299 to get your project started today!